WILL BE OFFERED EACH EVENING AT 5:30 P.M.
Cel. We have come together in the power of the Spirit to give thanks to our Father in heaven for his great love for us, a love revealed in Jesus and symbolized by His Sacred Heart. As we prepare to unite our hearts with His in offering this Eucharistic Sacrifice, let us pray for ourselves and for all the children of God. Lec. For our Holy Father in Rome, for the bishops of the world, and for all the People of God: let us pray to the Lord. ALL: Lord Jesus, hear our prayer. Lec. For the world you came to save, that all may open their ears to your gospel and open their hearts to your love: let us pray to the Lord. Lec. For the Church, sprung from your side as you died upon the cross, that it may be a beacon of the Way, the Truth and the Life: let us pray to the Lord. Lec. For all who are in any way afflicted that they may find comfort for their spirits in the tender love that wells from your Sacred Heart: let us pray to the Lord. Lec. For ourselves, that we may be ever faithful to our baptismal commitment to you, and bring your word and your love to the world in which we live: let us pray to the Lord. 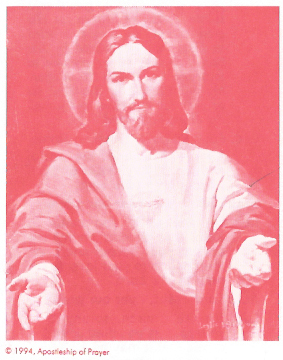 Lord Jesus Christ, / you have called us / to share your saving mission. / We accept this mission / and we renew today / our baptismal commitment / and all that we do / to be united with your Eucharistic offering / to our Father in heaven. 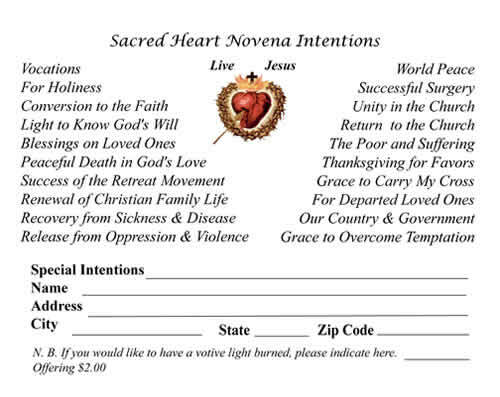 That we may serve you with greater fidelity, /we ask you, / our divine Mediator, / to obtain for us / the favors we seek in this Novena. (Pause) Deepen our faith / and touch fire to our hearts / that we may respond with love / to the great love for us / and for all men / that fills your Sacred Heart. Lord Jesus Christ, we give you thanks. We thank you, Lord Jesus, for becoming our brother, for making us sons and daughters of your Father, for breathing into our spirits your own divine life. We thank you, Lord Jesus, for your risen presence in our midst and for your saving action in our Church. We thank you for sending us your Spirit, your abiding gift to us of love and truth and peace. We thank you, Lord Jesus, for this renewal of your Sacrifice, for coming to us in this Eucharist, for making us more one with you and with each other in the depths of your Sacred Heart. Lord Jesus Christ, we give you thanks. We give you thanks for your great love for us and for all your wondrous gifts.